Situated at the heart of England, our venue for the AM100 Dinner, the Hilton Birmingham Metropole, is situated in a prime location on the NEC complex making it easily accessible to all guests via road, train and air. 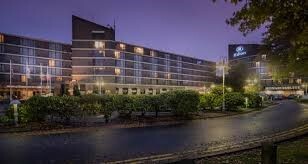 As the largest hotel in England, outside of London, the Hilton Birmingham Metropole offers 790 rooms, a heated indoor swimming pool and 24 hour room service and leisure centre access. Hilton Birmingham Metropole, the NEC Birmingham, Pendigo Way, Birmingham, B40 1PP.